Directed by Luke Greenfield and based on the best-selling novel by Emily Giffin, Something Borrowed is the story of Rachel (Ginnifer Goodwin), a smart and talented girl who ends up torn between her best friend Darcy (Kate Hudson) and the man of her dreams Dex (Colin Egglesfield). Coincidentally, Darcey and Dex and engaged. Listen, I never said rom coms were particularly inventive. At least she doesn't have a closet of bridesmaids dresses. Naturally, Rachel needs a confidante and hilarious sidekick. 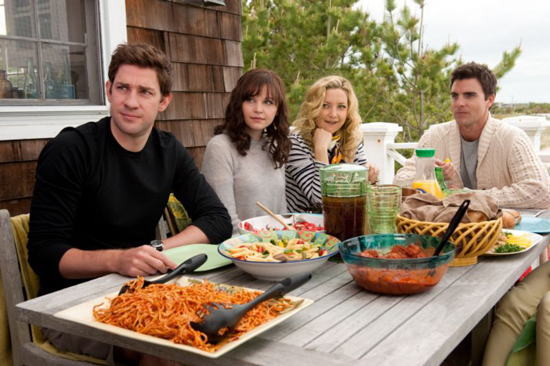 Enter Ethan, played by the reason I want to see this movie: John Krasinski. I mean, c'mon guys. Wouldn't you see him in anything?? Secret crush? Check. Evil bride? Check. Dance sequence in pajamas? Check. Definitely going to see it? Check. Something Borrowed hits theaters this Friday.